According to 451 Research, the number of mobile devices within the global enterprise market is forecasted to steadily increase over the next few years. As more companies embrace bring your own device (BYOD) policies, we experience a shift from office-centric models to mobile ecosystems–averaging three devices per employee. All of these personal devices require connectivity and security, thereby presenting a challenge for today’s enterprise IT decision makers. To further understand this issue, we sat down with 451 Research analyst, Ken Rehbehn, in a webinar to discuss the tough decisions facing enterprise IT teams. Upgrades and other innovative solutions are constantly knocking on IT directors’ doors, but new technologies are not always worth the time and resources needed for installation and ongoing maintenance. In this webinar, we shared how MulteFire technology can meet the coverage, capacity and performance needs of the enterprise with easy deployment and seamless mobility. for enterprise IT application–from universities to company campuses to construction sites. 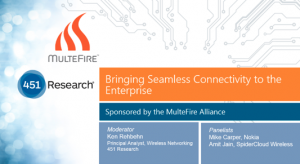 We encourage you to listen to the full webinar available here to learn more about how MulteFire provides seamless mobility for the enterprise. If you missed our other webinars, you can access the recordings via the following links: “Understanding MulteFire’s Radio Link”, “MulteFire’s End-to-End Architecture” and “The Promise of MulteFire”. Some say the holiday season slows productivity; however, I find that difficult to believe given the growing momentum and support for MulteFire technology. With the release 1.0 specification publication right around the corner, the MulteFire Alliance has kicked things into overdrive with event participation, industry liaison partnerships and online webinars. More importantly, the Alliance membership has continued to strengthen in numbers, as we have welcomed several new members. From mobile operators and cable providers to ISPs and various venue and enterprise owners, the Alliance supports the common interests of its members in the application of next-gen mobile cellular technology. Our newest members also include Comcast and CAICT, China Telecommunication Technology Labs-Terminals. Comcast will be a great asset to our membership base, helping to round out our expanding cable operator presence, while, CAICT, a prominent test lab in Asia, has joined at the opportune time as we begin discussions around MulteFire certification. As the president of the MulteFire Alliance, I am honored to be part of this collaborative group enabling the future of mobile cellular technology and a new way to wireless, and look forward to seeing the membership continue to grow. I encourage you to check out the rest of our newly redesigned website where you will find the current list of members, latest news announcements, as well as a resource library. There are several ways to get involved with the Alliance and promote the future of MulteFire technology, use cases and business opportunities. If your company is interested in joining the Alliance, please visit: http://www.multefire.org/join/become-a-member. Amidst the holiday cheer and before we ring in the New Year, I wanted to take the time to reflect on everything the MulteFire Alliance has accomplished in the last twelve months. We have achieved some significant milestones in our first year and are on track to make considerable strides in 2017. From cable operators and mobile operators to small cell and Wi-Fi vendors, we are growing in numbers and expanding our reach to all corners of the world. Global support is crucial for the adoption of MulteFire technology and I look forward to seeing our membership continue to grow in the coming year. With the Release 1.0 specification nearing completion, the Alliance has promoted key features such as end-to-end architecture, neutral host and radio link. Learn more by watching the recorded Light Reading webinars: MulteFire’s End-to-End Architecture and Understanding MulteFire’s Radio Link. This is merely a snapshot of the Alliance activities from the last twelve months and does not account for all the behind-the-scenes work that goes on within the various technical working groups, marketing committee, Executive Committee and the Board of Directors. Each of these groups keep the wheels turning via weekly conference calls and frequent face-to-face meetings in all regions of the world. We have completed a tremendous amount of work in a short period and I am honored to be part of this cross-industry, collaborative group. The potential applications for MulteFire range from private networks to industrial IoT to neutral host solutions – and that is only the beginning. A special thanks to all our members for their unwavering support and I look forward to what’s to come in the New Year.